1. I am now employed. I was hired on full time to a bakery that bought the bakery I worked for in high school. So, to continue after a summer of visiting farmers’ markets, I will now be selling specialty bread at them. Granted, I’d rather be doing this in northwestern Ohio where my friends live, I’m still happy to have a job again. Luckily, they’ve stopped selling their bread at classy establishments like Trader’s World and Turtle Creek. 4. I ate dinner at a place called PJ’s in Columbus. Everyone else got one of their fat sandwiches, and I sort of felt like I was going to die, just by proxy. Blueberry Granola with Flax, nummers. I packed up things over at Matt’s house (where I lived all summer) and moved out. While packing up my dry goods, Branden made fun of me for how much I eat like a hippie. I had three kinds of granola in my cabinet, so what? 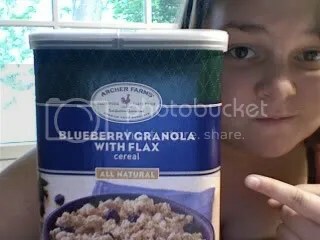 Anyway, I just wanted to give my shining endorsement on a product that I just tried for the first time this morning: Archer Farms’s Blueberry Granola with Flax cereal. I got it form Target back in May and haven’t tried it until today, but I have to say that I wish I had opened it before. First of all, this product has blueberries in it. Not like little lame shriveled up blueberries that are bitter and kind of crunchy, but blueberries that look like blueberries. BLUEBERRIES! Not fresh, obviously, but once they hit milk, they might as well be. Its high content of alpha linolenic acids has made the ancient flax seed become our modern miracle food. Alpha linolenic acid is a type of plant-derived omega 3 fatty acid, similar to those found in fish such as salmon. Benefits of flax seed as shown in many studies include lowering total cholesterol and LDL cholesterol (the Bad cholesterol) levels. Other benefits show that flax seed may also help lower blood triglyceride and blood pressure. It may also keep platelets from becoming sticky therefore reducing the risk of a heart attack. Anyway, great cereal. So happy I bought it.